VMedia is one of the Market leaders in the Multimedia Industry since its foundation in 2013 offering High Speed Internet, IPTV and Phone services across Canada are proud to be present in the beautiful city of Sarnia where we continue to work with our customers as we introduce our brand new innovative Home Security service called VMedia Protect offering monitored wireless 24/7 Home Security to keep the homes in and around Sarnia free from the modern menace of intruders and burglaries. VMedia is the company you can trust with our proven dependability, low prices, flexibility, and awesome customer care is simply legendary! Sarnia is a port city located in Southwestern Ontario on the shores of Lake Huron with superb marina and fabulous beaches and stunningly picturesque scenery including Lakeside Beach, Cantara Beach and Park, Lighthouse Park and Beach and many more offering so much outdoor activities like swimming, boating, superb fishing, hiking, camping, golf and a multitude of parks and trails with so much wildlife, forests parks, trails and gardens – a nature lover’s paradise! The city has a friendly vibe and really nice hotels ,restaurants, shopping cafes and galleries including Judith and Norman Alix art gallery and it’s highly popular museum called Stones‘n Bones – showcasing the area’s rich history and proud association with our Indigenous First Nations communities making it an ideal city to visit or live in. VMedia are delighted to be associated with this wonderful city of Sarnia and the surrounding communities and are committed and focused on improving and upgrading their services ensuring our customers get the best from us – always! The Internet continues to be recognized as one of the most important inventions in this Digital Age of connectivity and is essential for everyday living here in Canada and all across the world. VMedia is a highly popular ISP provider since 2013 and continues to develop and upgrade its network as it expands to many provinces including Ontario offering a truly dependable Internet with fast speeds, no limits, no contracts and a wide range of Internet Deals and Intern Plans to suit every location and budget with our highly experienced Technical Support Team available seven days a week keeping everyone connected – that’s awesome customer care as standard – only from VMedia! Currently across Ontario and the Sarnia area, VMedia offer Cable, DSL or FTTN options with a variety of Plans and prices that offer huge savings and value for your dollar. Our friendly Sales Team will advise and assess what Plan will suit your location and needs then match this with the cheapest price available – that’s our promise! Click here for all Internet Plans, Internet Deals and prices. VMedia are really excited to offer our customers in Ontario and the Sarnia area our new 24/7 monitored wireless Home Security service called VMedia Protect designed and created with your safety and home security in mind and offering something money cannot buy – peace of mind. Canada like other countries is experiencing increases in burglaries across the provinces in 2018 and VMedia want to stay one step ahead of the intruders by protecting and monitoring your property 365 days a year. VMedia Protect is a cost-effective solution to your home security needs and once installed your house, apartment or condo will be guaranteed the highest level of professional monitoring from our 5 diamond and ULC industry certified (the highest certification in the industry) central monitoring Station with our highly trained and skilled Home Protect Team keeping you safe and secure at all times and will notify you and the local police immediately if your alarm is triggered. Our Security Hub (control panel) and all sensors are designed and manufactured to the highest standards of technical excellence and are easily installed anywhere within your home allowing instant and seamless reporting over the internet or cellular connection directly to our Monitoring Station. Our unique Security System comes with a free app so you can remotely arm /disarm your system and receive constant communication alerts wherever you are. VMedia Protect comes with absolutely no contracts and comes with a 30-day money back guarantee! The VMedia Protect Kit contains all you need to secure your property and valuables and will be delivered to your home directly and includes The Security Hub (main control panel) x 1, Door / Window sensors x 2, PIR motion sensor (pet friendly!) x 1 and window decals (informing any unwanted intruders that your home is fully protected and monitored 24/7 by VMedia Protect) x 4. More sensors and other items can be added subject to your property size and requirements. Cost of VMedia Protect Kit is $229.95. The Security Hub is the main control Panel for your home security system and is easily placed within your home and only requires an internet connection enabling instant Central Monitoring Station reporting (optional GSM upgrades are also available), and the sensors and PIR motion sensors wirelessly connect wirelessly via RF offering complete protection with no wires, drilling or fuss and includes a built-in battery for power outages! Once installed your property is now ready for complete home protection with VMedia’s home monitoring from our Central Monitoring Station. We offer 2 great service plans called Protect and Protect Plus at really competitive monthly rates to offer you the most professional monitoring when you leave your home. Protect offers 24/7 professional home protection with our Monitoring Station 365 days a year keeping you constantly informed and updated via the internet with text, email or push notifications. We can also remotely arm / disarm your Security Hub if required. Protect Plus also offers 24/7 professional protection with our Monitoring Station 365 days a year keeping you constantly informed and updated with dual communication via the internet and cellular with text, email or push notifications. We can remotely arm/disarm your Security Hub if required. VMedia offer extra accessories at really low prices to customise every property and offer complete protection to extra area’s and rooms including extra sensors, PIR motion sensors, window decals, key fobs, GSM upgrades and a Pin Pad that can be included and placed at any entry /exit points so your Security Hub can be armed/ disarmed using your own private security code. Our Sales Team will be happy to answer all your Home Security queries – just call us! When your VMedia Protect Security System is installed VMedia will offer a home Insurance certificate that could make you monthly savings of between 10% – 15% with your Home Insurance Provider! VMedia Protect – guaranteed to exceed expectations! IPTV is next generation Television as it uses the mighty Internet to stream TV entertainment and much more in an instant and is increasing in popularity across the world and here in Canada due to the widespread availability of the internet and continued advancements in Technology. VMedia is providing an IPTV service in Canada since 2013 with phenomenal success offering superior choices, low prices and new TV experiences enjoyed by our satisfied customers who appreciate a company who continue to push the boundaries of excellence and provide the most comprehensive Canadian, US, and International networks and channels – at amazingly low prices! 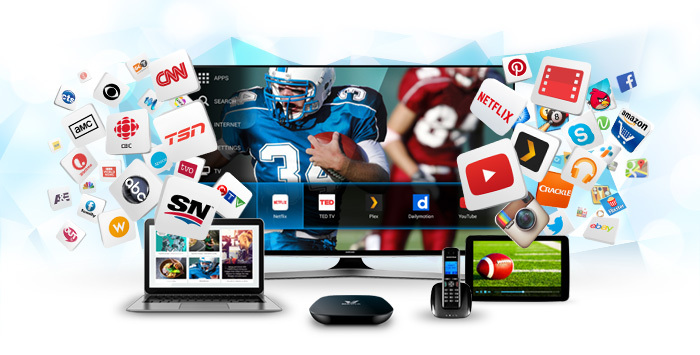 VMedia IPTV offers our customers in Sarnia a superior quality service that will be streamed instantly via our IPTV box called The VBox bringing the latest and best TV channels, news, sport, kids, films, music, games and much more. The VBox also acts as a browser giving access to The Web, Facebook, Twitter, Skype, YouTube, Netflix, Plex, XBMC, Instagram, Picasa and 100’s of apps for all ages and interests! VCloud and PVR are also features of the VBox allowing recording and a seven-day “scroll back “option so you never miss your favorite programmes and PVR to rewind, pause, stop, or fast forward recorded programmes adding even more flexibility and fun! VMedia Packages and Theme Packs continue to offer superb choices and exceptional value for money with channels from all over the world – starting with our most popular Package in Canada called TheSkinny – offering 23 channels for only $24.95/month, the Basic – offering 45 channels for only $35.95/month and new The Premium Flex offering 4 complete options – Premium Family, Premium Classic, Premium Sport and Premium Lifestyle for only $49.95/month and the Grand Premium offering 100 amazing channels for only $67.95/month! Theme Packs guarantee even more excitement and fun at low prices too! Knowledge, Style, Lifestyle, Discovery and much more! UChoose allows you to create your own unique personal viewing and lets you choose from over 160 standalone with prices as low as $2.95 per channel – simply amazing! Click here for all available channels, Packages, and Theme Packs and prices! VMedia IPTV – the future of home entertainment and more! The invention of the Phone we can connect with family and friends in every corner of the globe and here in Canada VMedia remain one of the Market Leaders since 2013 connecting our happy customers with a variety of low – priced Plans to suit every budget here in Ontario and the city of Sarnia. VMedia Phone continue to upgrade and improve our network to guarantee our customers enjoy the best phone service every day and our Technical Support Teams are available seven days a week to keep everyone connected – guaranteed! Home Phone offers low monthly bills, 15 Phone features, no contracts and the first month free! Canada and USA Plan offers unlimited calls all over Canada and reduced calls elsewhere for only $19.95/month. Click here for all Phone Plans, Phone Features and all prices. These prices represent the unbelievable value for money you only get from VMedia Phone! VMedia have the perfect combination of the latest innovative technology, highly skilled staff, friendly and efficient customer care, and excellent choices with a range of the lowest prices in Canada today. We thank our customers in Sarnia for their continued support and guarantee the best High-Speed Internet, IPTV, Phone and our new wireless monitored home security system called VMedia Protect to keep our customers safe and secure 24/7. Why not call our Sales Team today at 1 – 855 – 333 – 8269 or visit www.vmedia.ca for all information, current deals, bundles, special offers and all our famously low prices! VMedia – unrivalled in Canada today!